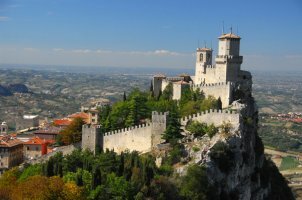 The economy of San Marino is based on banking, wearing apparel, including fabrics, electronics, ceramics, tiles, furniture, paints, and spirits/wines. San Marino sells collectible postage stamps to philatelists. The main agricultural products are wine and cheeses. The per capita level of output and standard of living are comparable to those of Italy, which supplies much of its food. In addition, San Marino maintains the lowest unemployment rate in Europe, has a state budget surplus, and no national debt. Income taxes are much lower than in Italy, and there are therefore extremely strict requirements to obtain citizenship. One of the greatest sources of income from tourism comes from the sale of historic coins and stamps. In 1894, San Marino issued the first commemorative stamps and since then that has been part of a large livelihood in the republic. All 10 of the Post Offices of San Marino sell these stamps and collectible coins, including "Legal Gold Tender Coins". Exports of San Marino include washing machines, woodworking machines, light pure woven cotton, clothing accessories, glazed ceramics, rubber pipes, cigarette paper, aluminium bars, pesticides. San Marino's main export partners are Romania, Austria, Germany, Brazil, France, Russia, Poland, United Kingdom, United States, Slovenia. San Marino's economy is based on production of food crops, sheep farming, and stone quarrying. Today farming activities focus on grain, vines and orchards, as well as animal husbandry (cattle and swine). Key industries include banking, electronics, and ceramics. The main agricultural products are wine and cheese. San Marino's postage stamps, which are valid for mail posted in the country, are mostly sold to philatelists and are a source of income. San Marino is a member of the Small European Postal Administration Cooperation. The per capita level of US$55,449 and standard of living are comparable to that of Denmark. San Marino imports goods such as food from Italy. San Marino's main imports are petroleum gas, coated flat-rolled iron, raw aluminium, animal food, non-knit men's shirts, raw furskins, footwear, cars, non-knit women's suits. San Marino's main import partners are Netherlands, Germany, Romania, Italy, Poland, France, Slovakia, Belgium-Luxembourg, Russia, Austria. 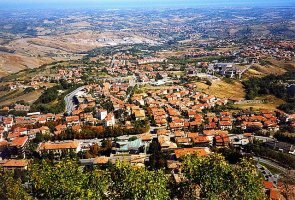 San Marino is a microstate surrounded by Italy, situated on the Italian Peninsula on the northeastern side of the Apennine Mountains. It is a member of the International Monetary Fund and the United Nations. Trade between the European Community and San Marino is exempt from all customs duties. Imports from non-EU countries are subject to customs duties - the same established by EU countries. Imported goods must be accompanied by import permits, health and phitosanitary certificates.